There are many different AED manufacturers on the market. 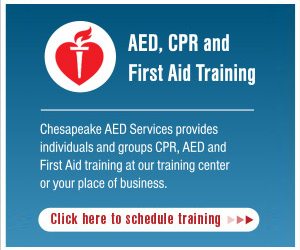 The owner of Chesapeake AED Services is a 25 year veteran paramedic who has used defibrillators and then Automated External Defibrillators. He was involved with the first pilot program of AED’s in the state of Maryland. There is a Physio Control LifePak AED for any application, from the value priced LifePak Express, to the ease of use Automatic model LifePak CR Plus , to the professional use LifePak 1000 the only AED tested that passed all the requirement to be deployed on the International Space Station. We are so confident in the Physio Control LifePak line of AED’s that they are the only brand we recommend. More professional use LifePak devices than any other manufacturer. LifePak defibrillators have been used in more medical emergencies than any other manufacturer. The CR Plus AED will automatically shock a patient if it’s needed. It will not shock someone who does not need it. Clear concise voice prompts calmly guide the lay rescuer through the process. The LifePak AED’s charge paks cost approximately $100.00 and include 2 sets of adult electrodes. Since the charge pak and electrodes are replaced at the same time there is no headache of replacing the battery one month and electrodes at another month. They are synchronized.